Timex Group UK has added Kenneth Cole watches to the portfolio of brands that it distributes. From April, watches from the New York fashion house will be available to retailers across the UK and Ireland. Kenneth Cole watches are designed and manufactured by Geneva Watch Group in New York, which is owned by TWB Investments. “We are thrilled to be partnering with TWB Investments Ltd to distribute the Kenneth Cole watch brand in the UK and Ireland,” says Duncan Harris, Timex UK sales and marketing director. “The brand’s iconic New York based fashion heritage, together with its modern design cues make it a perfect addition to the growing Timex Group portfolio of brands and we look forward to building the brand and distribution network with our key retail partners. 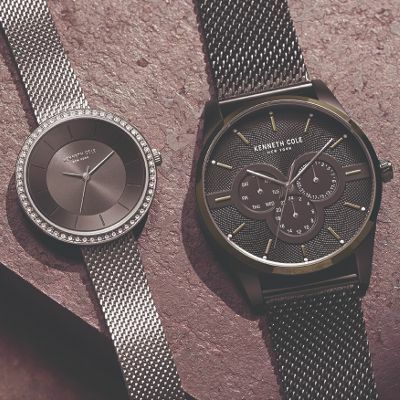 Working with a globally renowned brand such as Kenneth Cole gives Timex Group UK the opportunity to further grow our fashion watch portfolio,” he adds. Kenneth Cole joins Timex, Nautica, Versace, Versus and Ferragamo timepieces in the Timex Group distribution line up.